Welcome to my column where each month I’ll take a book from the shelf to share. With the push to re-establish an NT literary journal of ‘our own’ gaining momentum right now, I thought I would turn my attention to journals. Rather neglected in literary review, journals offer regular curated encounters with diverse contemporary writing and are often the springboard for many great writers. One journal that I’ve found particularly impressive of late is The Lifted Brow. Since its first issue in 2007, The Lifted Brow has exploded onto the literary scene as an enabler and disrupter. A vibrant, edgy journal that champions new and diverse voices, the Brow is a breath of fresh air in the notoriously stuffy literary establishment. The recent ‘Blak Brow’ edition is revealing of the journal’s generative approach. ‘Blak Brow’ is a collection of essay, art, poetry and story by Aboriginal and Torres Strait Islander women. 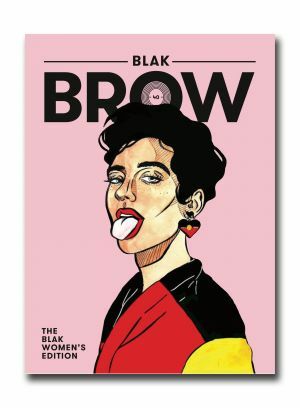 More than a thematic or token issue, the production of ‘Blak Brow’ handed over editorial control to an all-Aboriginal ‘Blak Women’s Brow Collective’. It is this distinctly anti-individualist approach that gives the issue its collective strength. Dedicated to all the Grandmothers, Mothers, Aunties, Sistas, and Sistergirls, Cuzzies and Tiddas gone before and those to come, the ‘Blak Brow’ is powerful reading. While predominantly focused on writers based in Narrm/Kulin nations, there is much of relevance for NT readers particularly around themes of sovereignty, incarceration and injustice. Content ranges from Lidia Thorpe’s maiden speech, new and old poetry, exhibition catalogues, to a conversation in verse between Ellen Van Neervan and her Mum, Maria Van Neervan-Currie (both guests of last year’s NT Writers Festival). Other standouts are ‘Long bum’: a poignant reflection by Eugenia Flynn on returning to Darwin, and ‘Sovereign Debt’ by Latoya Rule: a devastating account of receiving an invoice from the State to pay for the death of her brother in custody. It feels somewhat reductive to draw out these highlights in isolation though, given the collective power of this edition – the strength, resolve and dynamism of Aboriginal and Torres Strait Islander women is most potent in reading the whole. Overland – quarterly print, some free online content – cutting edge essay, excellent review, fiction and poetry. Regular columns by Tony Birch and Alison Croggon are highlights. Meanjin – quarterly print since 1940 – always exceptional essays, review and fiction. Griffith Review – quarterly print and online – long-form essay, reportage and review, keep an eye especially for the latest issue 63: ‘Writing the Country’. Closer to home Flycatcher Mag out of CDU is always an excellent and eclectic read, and I am eagerly waiting to get my hands on a copy of the Queer Territory zine launched recently by local writer, artist and producer CJ Bell. Happy reading, there’s a lot already out there! Kate Rendell works as a project co-ordinator in the arts. She is also a freelance writer and researcher. First and foremost though, she is a reader.